Part of our mission is to build an awesome organisation that inspires, and that includes inspiring other startups. We love it when people see what we have done and get inspired to go and do something of their own. 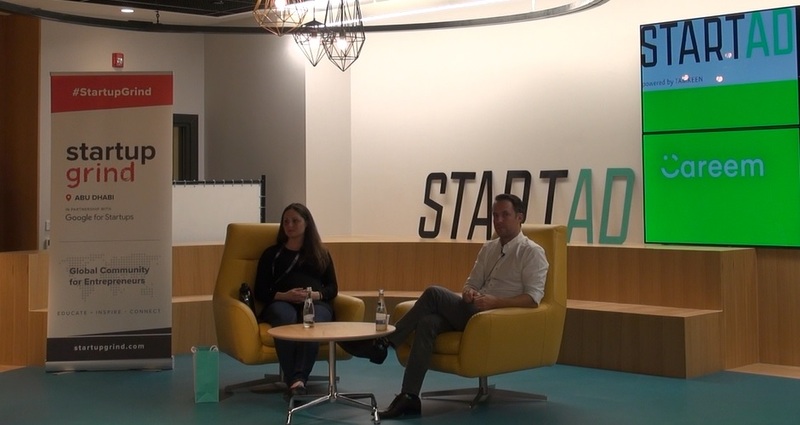 Careem’s co-founder Magnus Olsson spoke this week at NYU Abu Dhabi’s Startup Grind event. So what’s the reality of the angel investor scene here in the region? It’s shifted a lot in a better direction over the last six years – when we started there were just a handful of VCs that invested in the region. If you’re a hotshot series entrepreneur in some places, all you need is an idea on a piece of paper. You can then go to someone and say, “I’ve got this idea. I’d like a $5 million pre-money valuation give me a million dollars” but you can’t do that here because it’s a different environment. In our region, if you go to someone and ask for money they will say “sure and we’ll take 99 percent of your company because we put in the money so why should you get anything” so it’s typically a different type of conversation. We were fortunate enough to be able to start off with $100,000 between the two of us that we put in ourselves. Our angel investors at the start really were friends and family. My co-founder’s mother-in-law wanted to invest and he told her not to do it because it might not go well, but she insisted. There is a big opportunity and that if it becomes successful it could become really big. They want to see that you have had some early traction – just having an idea and a PowerPoint presentation is fine, but show us that some customers love you. Not necessarily revenue but show that people are using and loving what it is you have built. They need to believe in you as a team. If you’re only halfway in and staying in your day job or still taking classes and saying that once you get finding then you will leave, I wouldn’t invest in you. People need to know that for you it’s do-or-die. How can you show traction in the cheapest possible way? You don’t want to waste a lot of time or money. That’s the whole concept of Minimum Viable Product and getting something out there. Trying to build the perfect thing from the beginning doesn’t make any sense. We did this as a convertible debt, because in the early days it is very challenging to discuss valuation. You come to an investor and you say “I have five customers that have taken 100 rides and they really like it and I think this is worth $5 million” then they’ll probably say it’s worth nearer $50,000 so it doesn’t even make sense to discuss valuation in the early days. But doing a convertible structure where you say that you will raise a real round of funding later when we are bigger and if you invest now then we will give you something in return – a nice discount for that round. That’s what we did. And the earlier the investor the bigger the discount you’ll get, because it’s painful to get people to wire the money. Time is on their side because the longer they wait, the longer they get to see if you are becoming successful, so you need to push them over the edge. Every week from when the investors put in the money to when we did the funding round there was a scale of one percent extra discount so we really tried to get people to invest early that way. These days there are a lot of hobby angels and professional angels investing in the region. But while the landscape has improved it’s still not like it’s raining VCs around here. It’s a luxury to have too much choice but when you do your first VC deal, it’s not all about valuation. People often think the most important thing is “what valuation can I get and how much can I raise?” and of course these are important but you don’t want to give away all your company on the first round, then there’s nothing to give away later. We are in one of the most exciting regions in the world, from Morocco to Pakistan and from Turkey to Sudan – about 700 million people, roughly 10 percent of the world’s population. The average age is 25 which means that people are young and willing to adapt and change fast. And they are connected as smartphone penetration is upwards of 40 percent, which is higher than China, and in the GCC people have two or three phones. People buying stuff in the region – food, rent, transportation, etc – total about $1.8 trillion. But only two percent of that happens online, compared to 15-20 percent in more developed markets. In the next ten years, let’s call it our 2030 vision, that’s going to go to 10-15 percent in the Middle East. That means that when 10-15 percent of that $1.8 trillion goes online it becomes a $500 billion market. It’s going to grow like crazy. There’s a lot of other considerations such as what control do you give away? Board matters and governance matters, who can take a salary, can you hire people and so on. If you get that wrong early on then you can end up stuck with that for a long time. It’s important to get proper advice from someone on how you are going to structure things because if you don’t have good legal advice then you’re going to be clueless about all the terms that the VC will come up with. These days there are firms that will give advice in exchange for taking a small stake and I think that’s worth doing. Leave it late though. If you always play by the book all the time, then it will slow you down and cost a lot of money. You might need to have some sort of company for visa reasons, but I was just sponsored by my wife for a long time, so if you have a partner who can do that it can be good. Although I actually needed an NOC from my wife to have permission to start Careem! If you can do a cheap set-up in one of the incubators or accelerators than it’s probably good to have a company, but for many things you don’t need it. You don’t need a company to set up an account on AWS to spin up your website, you don’t need a company to hire programmers to do some coding for you, and so on. The time you need a company is when you get to the point when you start charging someone, and then for fundraising. Our experience was, if you’re going after international investors then they’re still not super-comfortable with investing in a company based in the UAE because they don’t necessarily understand it. It’s not because it’s good or bad, it’s just that they haven’t done it that much, so we set up a holding company in BVI because it was the cheapest. Everyone is busy but if you meet something that you care a little bit extra about then you’ll find to time speak to them, whether that’s at midnight or at the weekend. I’m going from Abu Dhabi to Dubai so join me in the car… that type of thing. I like founders and entrepreneurs that are a little bit crazy about their idea and that’s the secret. I don’t think mentor relationships should be too formal and try to have more than one person who can give you advice on many topics. And have mentors that re as open and direct as possible, you don’t have to take their advice, but it’s better to have people who are opinionated and tell you that they think it’s a terrible idea because that will challenge you to improve. Never look for people who are trying to make you feel good because they are useless. We are a tech platform and anything we can do to help bring the region online is good. Ultimately we would like to build the blocks for other tech companies to build on. So it’s not just us as Careem serving customers and Captains, but us serving the ecosystem. We are in 120 cities in 15 countries but if you want to send an SMS to people in all of those countries it was a mess. You had to sign up to lots of SMS gateways in different countries but we solved that, among other things. Now if an entrepreneur wants to build their things they can focus on just building it and use the building blocks we have set up rather than having to go through all the same processes that we did. We have a Careem Platform Service that are building a set of APIs that you can use to build on top of our services. You can go to our Developer Site to see more. We are the technology platform for our region.